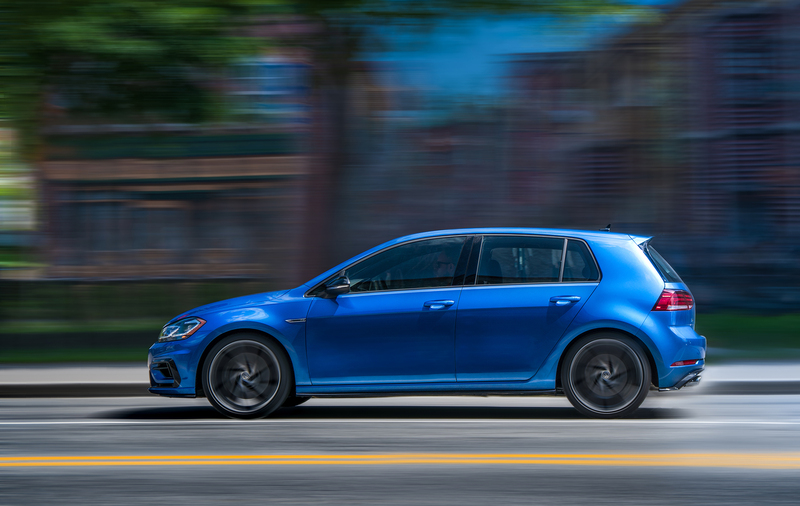 When the 2019 Volkswagen Golf R is fitted with its dual-clutch automatic gearbox, it sprints from a standstill to 100 km/h in under five seconds. But chances are you won’t notice it as it flies by you at full steam. This is the Golf R’s secret weapon, its subtlety. What you have here folks is a low-key compact hatchback that will carry the kids to school during the week and double as a fierce track machine capable of hunting down Camaros and Mustangs on the weekend. The Golf R went through a slight facelift in 2018 and will soldier through 2019 unchanged. That is, for Canada it will, because the US will finally get the rainbow of new colors Volkswagen calls Spektrum. It’s a $2,995 option, also available on the e-Golf, that unlocks 40 flavors of paint. Forty! And what a choice you get; there’s orange, yellow, brown, purple, even fluorescent green! There are ten shades of blue, for crying out loud. The one you see here, for instance, is called Laser Blue Pearl. It’s a rad idea from Volkswagen, and adds charisma to the somewhat subdued Golf, especially now that it faces more flamboyant rivals. But it ain’t cheap. 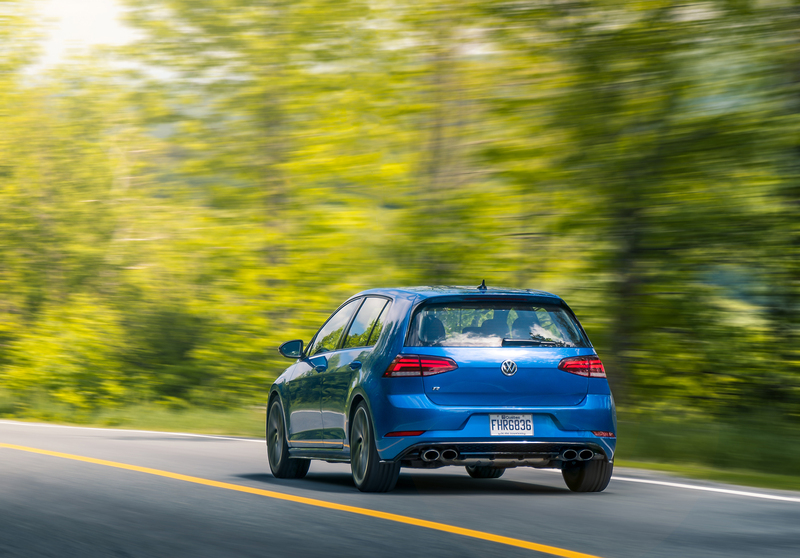 A base Golf R kicks off at $42,065. So while that “91 Blue” color may remind you of the MKII Golf you drove back in high school, it’ll considerably inflate the price of an already expensive hot hatch. But you do get a lot of car for the price. 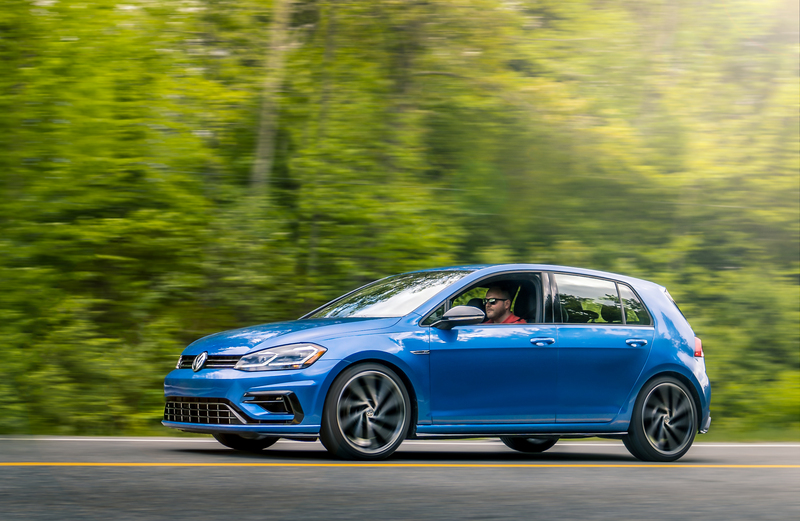 The Golf R is all-wheel drive, contrary to the Golf GTI which isn’t. Its engine is more powerful – it’s still a 2.0-litre turbo four, but with considerably different internals – good for a healthy 292 horsepower and 280 lb-ft of torque. For 2018, the DSG automatic got an extra gear, from six to seven. 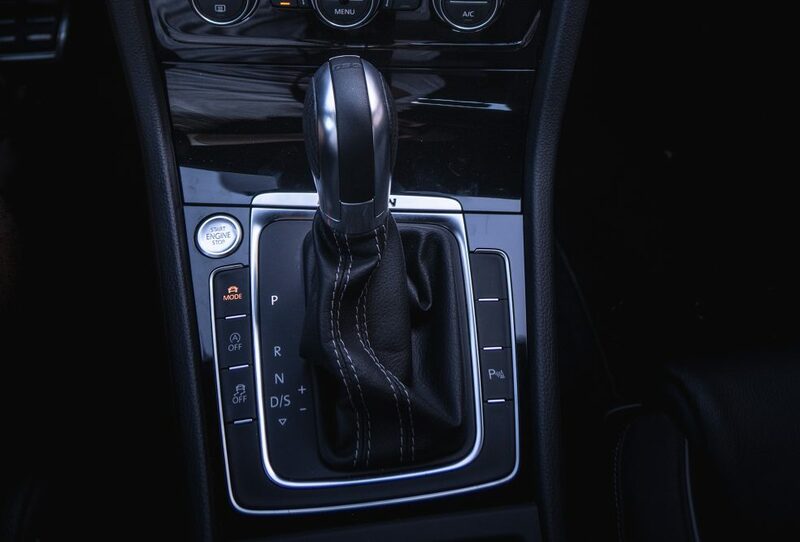 And yes, the six-speed manual is still available for our market. At least, for now it is. So please, buy one before Volkswagen kills it like it did in other markets. Other changes from the facelift include new wheels, a revised fascia incorporating new LED headlights and bumper. The taillights are also full LED now, and all Golf R’s come with the full LCD Digital Cockpit, like the one found in some Audis. There’s also an updated, almost entirely touch-operated infotainment system that’s Android Auto and Apple CarPlay compatible. Sadly, the R still doesn’t come with a sunroof option. It felt good to get back behind the wheel of this super Golf after driving its rivals, the Honda Civic Type R and the Subaru WRX STI. As you all know, I’m a huge fan of the Civic Type R, and I continue to believe that it is, without question, the best track tool to come with a trunk and a rear seat. Not that the Golf R isn’t capable. It is. This remains a respectfully quick little car, Volkswagen claims a 0-100 km/h time of 4.8 seconds (with DSG), which is quicker off the line than the Civic. And its engine has a fat torque curve that kicks in at 1,800 rpm. I’m also at peace now with the synthesized engine sound Volkswagen calls a Soundaktor. Yes, it’s all fake but it adds character to an otherwise muffled machine. When you gun the throttle, the cabin fills up with a nice brawny bellow of intake sound, kind of like a VR6, and that’s fun. But the car is simply not as focused as its rivals. It suffers from turbo lag, which is kind of inevitable when you’re trying to extract nearly 300 horsepower from a four-cylinder engine, but remains more noticeable than in the Honda, yet less so than in the Subaru. How’s the DSG automatic? It’s one of the rare automatics I’d recommend, actually. Its rapid fire shifts, accompanied with occasional exhaust farts, and snap-tastic downshifts, never make the car feel slow. If you want maximum performance and fuel economy (8.7L/100 km combined) from this car, as well as launch control, you’ll need this gearbox. It’s arguably one of the best dual-clutch systems out there. Still, I’d get mine with a stick. As much I adore the 2019 Golf R for what it is, it gets somewhat clumsy when pushed hard on a track. Sure, there’s a lot of grip thanks to all-wheel drive, Volkswagen’s 4MOTION system can send up to 50% of the available power to the rear wheels. But it remains a reactive system, unlike Subaru’s which is always on. 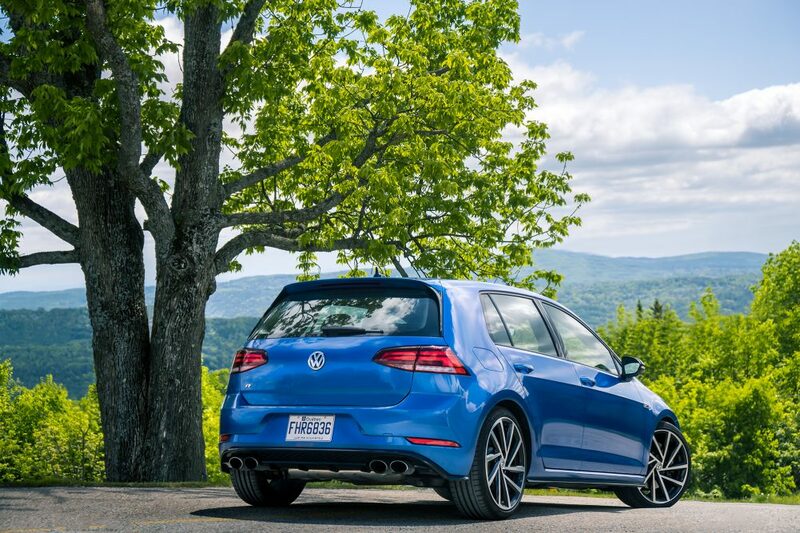 This means that the Golf R is first and foremost front-wheel drive, and kicks in to AWD when slippage is detected. It’s what geeks call a Haldex system or Borg Warner now. It all happens so quickly, you’ll hardly notice it on the road, but at the track, it causes the car to understeer quite a bit more than its all-wheel drive rivals. Actually, I still find a GTI’s rear-end to be livelier than this when lifting off at the limit. And the Golf’s suspension always remains somewhat on the soft, compliant side, even when the car is set to Race mode. Now, by soft, I mean softer than an STI and a Type R, because for common mortals like you and me, the Golf R is still rather stiff, and rock solid. 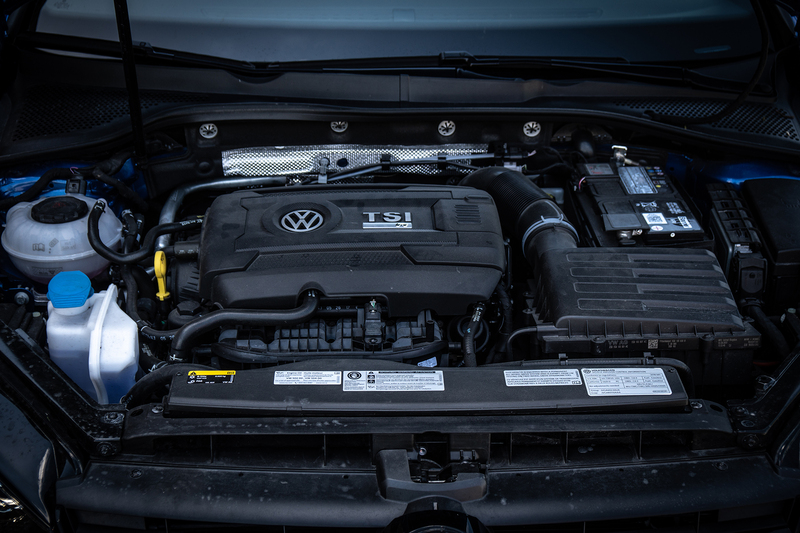 It’s on the road that you understand this car, during the duties of your everyday lives, when set to Comfort mode where its adaptive dampers soften up, that the Golf R shines over the others. Its cabin is extremely well-appointed, filled with rich materials and impeccable build quality felt through vault-like doors and a solid composure over rough roads, feeling like a little Audi. The sports-leather seats are supportive and immensely comfortable when cruising on the highway (but the Civic Type R’s are still better), and all controls are simple, straight-forward and well-laid out, especially the infotainment system which is a breeze to operate. Finally, cargo space is up there among the best of them. With 1,520 litres of total space, the Golf out-cargos some sub-compact crossovers. 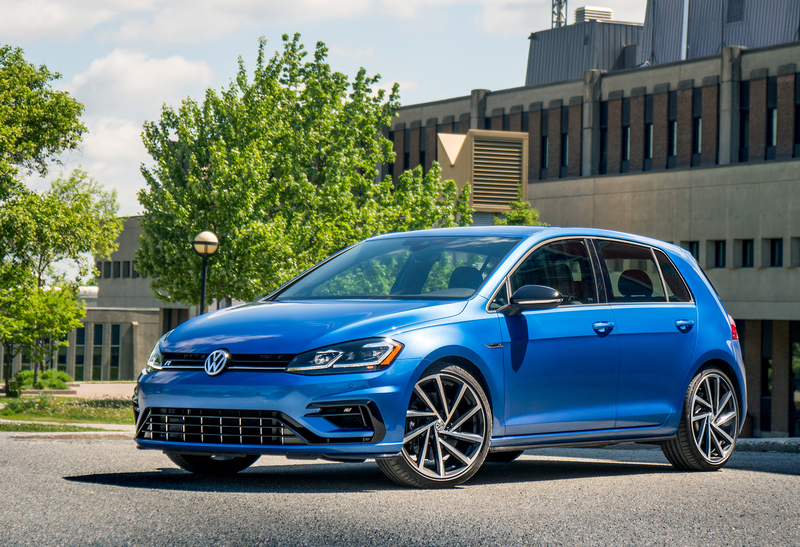 The 2019 Volkswagen Golf R is near perfect then, and yes, if you ask me which hot hatch I’d prefer in my driveway, it remains this one for its undeniable balance of everyday driveability and satisfactory performance encapsulated in a premium package. Sure, it gets slightly eclipsed by its rivals on a performance standpoint, but it’s nothing a good driver with a few aftermarket mods can’t fix. That said, there are a few flaws, but they’re tiny. While I had mine, I couldn’t help but hearing an irritating drone from the rear mechanical components when driving it on the highway. I heard it in the two press units I drove. The rear seat in a Golf remains a tight fit for tall people, and although this car feels premium all the time, we are talking about a Golf that sells for roughly the same price as a BMW 3-Series. But hey, Volkswagen still sells the more value-packed GTI. The Golf R is the icing on the cake; it’s there for the fan boys and girls that simply can’t get enough Golf. If you don’t mind paying for one, it remains one of the most well-rounded hot hatchbacks currently out there. Looks great while remaining subtle. Near luxury car build quality and refinement. Great review. I have a 2018 R, and the comment you made about it being the best daily driver is spot on. As much as a type R, sti and rs are faster on the track, as a daily in the city, on back roads that are rough, the R shines above all. My neighbour has an M2, and when it was time to get a second car, he got an R for the same reason. As for price, once you price out an Audi S3, etc with the same equipment, avoid the special colours on the R and the R is actually a bargain for the performance and practicality you get. Have you shifted your opinion away from the GTI and towards the Golf R then? It’s funny how each time I drive one, I love it more than the other. However, I still firmly believe the GTI is the best value hot hatch.